Online gambling is legal and regulated in the United Kingdom by the Gambling Commission, which itself was formed by the Gambling Act 2005. Online poker, sports betting, casino games, bingo, and lottery-style games all fall under the purview of the Gambling Commission. Anyone wishing to offer these games to citizens of the UK must acquire a license from the commission. This is a nice setup for our readers from the UK, because you have a wide variety of safe and licensed gambling sites to choose from. 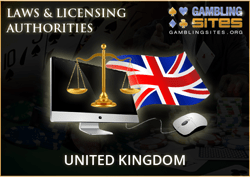 Unlike some other countries, the government of the UK doesn't criminalize online gambling. Instead, it fosters a safe environment with protections for players and operators alike. Gambling laws are vague and oftentimes contradictory in other parts of the world. This isn't the case in the UK. Thanks to the Gambling Act 2005, there's a clear framework for hosting games and placing bets online. The only thing you need as a player is to be 18 years or older and have a connection to the internet. Operators are required by the act to prove they are financially stable, capable of maintaining a stable financial position, and capable of providing fair games to players. The Act created the Gambling Commission to oversee the licensing and ongoing monitoring of gambling websites. The Gambling Act also made it possible for licensed operators to advertise in the UK. Just watch any major sporting event and you'll probably see at least one advertisement for a bookmaker, bingo site, or other gambling operator. These ads are possible thanks in part to the Gambling Act. The Gambling Commission was created by the Gambling Act 2005, and it regulates all forms of gambling, lottery, and bingo in the UK. This includes both land-based and online forms of gaming. The only aspect not regulated by the Gambling Commission is spread betting, which is overseen by the Financial Conduct Authority. The primary function of the Gambling Commission is to see that the three objectives laid forth by the Gambling Act 2005 are met. In short, it's the commission's job to ensure all forms of gambling are hosted in a safe and fair manner while offering protections for children and vulnerable adults. The commission evaluates potential operators for licenses, dispenses licenses, and then monitors existing licensees to ensure everything is run in a safe and efficient manner. So far, the commission has proven itself to be mostly effective at providing customers with a safe gambling environment. However, the Gambling Commission did suffer a blow to its credibility with the demise of sports betting site Canbet. Canbet ran into liquidity problems in late 2013 and over the next few months, hundreds of complaints came out from punters who claimed they were owed money. The situation at Canbet deteriorated from there, and the site eventually closed while still owing customers. The Gambling Commission later released a statement saying that although it's responsible for regulating the industry, it cannot be expected to monitor the financial health of every company at all times. The commission went on to state that it couldn't revoke the license of Canbet at risk of further damaging the company and leaving outstanding debts to players unpaid. Canbet surrendered its gambling license voluntarily in May 2014 and has yet to make good on its debt to customers. This series of events shook the public's trust in the commission. The state of online gambling in the UK is still decades ahead of the US and most other nations, but these events show that there's no fail proof method for ensuring the safety of all customers at all times. The Gambling Act 2005 forbids all foreigners and those without a Gambling Commission license from advertising their services to customers in the UK. The whitelist makes exceptions to the advertising ban for certain jurisdictions that prove they meet the standards set forth by the Gambling Act 2005. Operators with licenses in any of the following jurisdictions are considered "whitelisted" and may offer their services to customers in the UK. Some of the biggest names in gambling (such as William Hill) are based out of these jurisdictions in order to take advantage of friendlier tax laws. The Gambling Commission feels that the above jurisdictions have appropriately stringent licensing requirements for operators and is therefore comfortable letting those operators take wagers from customers in the UK. The whitelist has been the source of some controversy in past years. There are some government officials who have argued that regulators have never even physically visited the jurisdictions before whitelisting them and haven't done the proper research to ensure that their operators are actually held to a high standard. Other opponents of the whitelist claim that it violates the Gambling Act 2005, which expressly forbids any foreign operator from doing business in the UK. We haven't heard much from these opponents in more recent years, however, and things seem to be running well enough at the present time.